Testimony must be delivered in person the day and time of the hearing. Identity concerns everyone. The federal Real ID has changed names many times over in the guises of Enhanced Drivers Licenses and Passport cards and is seeking another face in Public Safety Chairman Tommy Merritts bill, HB 4036. If you privacy, identity security, personal sovereignty and the Constitution concerns you, please offer your testimony during this crucial and important hearing. This is your opportunity to change the destiny of identity in Texas. Here are some simple steps in order to successfully testify at the hearing on Monday. 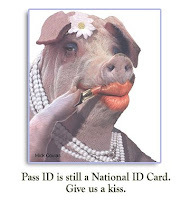 1) Review the bill you are opposing & understand why you oppose a federal ID. 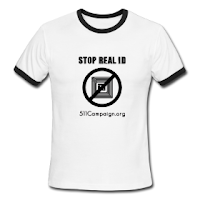 b) Visit 511Campaign.org’s TAKE ACTION TEXAS PAGE to research talking points and to understand what parts about the federal Real ID matter to you the most. For more points of reason to demonstrate to the Texas Public Safety Committee, please refer to TALKING POINTS section below HOW YOU CAN TESTIFY AGAINST THE FEDERAL ID. 2) Write your testimony down. The most impactful delivery of public testimony is documentation. You should prepare a 1- 3 minute speech on why you oppose the federal ID and deliver 11 copies of your written speech to the clerk with your name and address to present add to the witness list. If you don’t want to speak, you can deliver you written testimony with impactful and supportive documentation to oppose this form of identity by hand delivering it to the Committee Clerk as your name is called during the hearing. 3) Deliver your testimony during the 3/30 Public Safety hearing. Testimony must be delivered in person the day of the hearing. You, or the person you delegate in your place, should appear in person to deliver your testimony during the hearing. documentation, dressed appropriately with a calm, professional attitude. b) Bring 11 Copies of your spoken/written testimony to the hearing. c) Fill out a testimony card indicating the OPPOSED postion, name, address and other important information. Please see the Committee clerk if you need help filling out the card. d) Wait for your name to be called to deliver your testimony. When your name is called approach the indicated podium to deliver your objections to the federal ID. If you have not hand delivered your written testimony to the clerk, please hand it to the clerk before you go to speak. 1) Many people have similar things to say to the representatives on the matter, try to stick to the points you have organized by offering the uniqueness of your perspective on the matter and why it will affect your life personally. 2) The public hearing on this issue is set for the end of the meeting, so it may run later than expected into the evening. If it does run later and you have to retire, please leave your testimony with the clerk or a friend staying late to deliver when your name is called. 3) Stay flexible on times and wait creatively for the issue upon adjournment. Many people leave and watch the proceedings online instead of waiting and hanging around for hours for their bill to come up during public input. You can watch for HB 4036 during the Public Safety hearing on the legislative live stream Monday. When your bill is announced make sure you are close by or with in running distance from the Committee meeting. Use the talking points below to help shape or reinforce your own experience against HB 4036. Be vigilant about the time you spend on spoken testimony because you only have 1-3 minutes to deliver. A written testimony is a strong testimony. Good luck and we will look for you at the hearing!! Talking points are strong points to focus on to state your case when it is up for decision making. Here are a few key ideas we are focusing on to help form testimony during the hearing. We believe that the Real ID Act holds a placebo effect for those with sincere desire for immigration reform. Those on all sides will be dissatisfied with the applied regulations because the policy trends lean towards the lack of enforcement of laws currently in place. The DHS border wall fence will keep out 11% of immigrants seeking undocumented entry to the U.S. via border crossings. In these desperate times, people will become much more angry when solutions long needing attention are given only a place holder at their expense. A National Id is not a secure identity solution for undocumented citizens. It is an expense that Texans have less and less money for. We are spread thin. This is not where our money needs to be. Nor do we need to expose Texans identity across our country's borders where they are not protected. A nationalized ID card creates unnecessary mobility barriers for U.S. citizens travelling throughout the U.S. The obstructing nature of this ID could potentially hatch bureaucratic enmity between states in the same nation, and unnecessary alienation for travelling U.S. citizens who observe national identity regardless of State residence. A national ID indicating citizenship is an internal passport. A passport is necessary when going to and from another country. It is not pragmatic for mainland citizens who never travel outside the U.S. to use an internal passport, similar to those in closed societies, under unnatural surveillance. U.S. citizens who voluntarily participate in border cards using magnetic strips, RFID, and biometrics greatly increase their odds to suffer from identity security breaches. As regulated, key copies of identity materials like birth certificates and social security numbers will be aggregated onto numerous insecure technologies at expensive costs to the State and license applicant. [ i.e. biometric technologies, RFID chips, insecure databases storage technologies. Citizens loss of privacy and identity through hacking theft, point-of-sale transactions and data aggregates. Citizens who voluntarily participate in enhanced drivers licenses may suffer from identity theft starting with license vendor AAMVA. AAMVA openly admits are a 3rd party information clearinghouse and has sold commercial license information for years, including commercial transaction data from drivers. For example: Statewide inclusion of RFID readers at key points of public transit, such as stoplights, would collect license information on citizens and attributed data could be sold to 3rd parties without consent. Another more familiar example is the retail scanning of barcode and magnetic strip readers at point-of-sale purchases which transmits identity attributes to an unknown 3rd party. States should reject compliance with the REAL ID act because states will pay millions to comply with an unfunded federal mandate. If the state doesn’t pay for REAL ID, the costs will be passed on to people like us. The risk of identity theft looms large: REAL ID compliant licenses will have a machine readable strip that will contain utterly unprotected personal information. This means that the private sector and anyone with a barcode reader will have unfettered access to our data, exposing all cardholders to tracking, profiling and identity theft. The REAL ID act requires States to connect its Drivers License data to the data of all 55 other states and territories, and the federal government has mandated no privacy requirements or security plan. Given its size, the database will be hugely vulnerable to both insider and outsider fraud. The REAL ID application process will require that everyone apply and renew cards in person, leading to long lines of angry constituents. There is also concern that many groups of people, survivors of domestic violence and military personnel will not be able to produce the required documents to apply for a REAL ID compliant license. STAND UP FOR YOURSELF - TAKE ACTION!! !